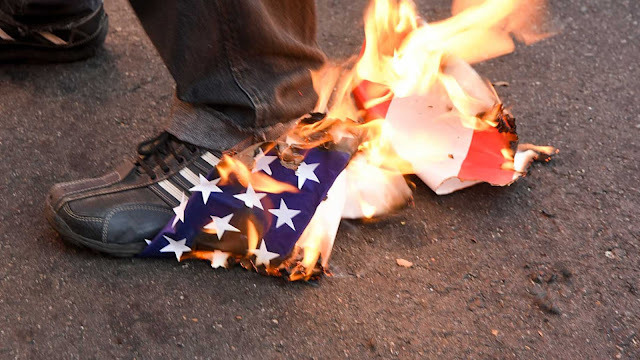 A new poll conducted for the Foundation for Liberty and American Greatness(FLAG) found that a huge percentage of younger Americans are expressing their disdain for American ideals; almost half believe America isn’t great, and roughly 20% think the American flag is “a sign of intolerance and hatred.” 29% were okay with burning the American flag. The poll, conducted by YouGov.com, surveyed 1,078 Americans under the age of 38. Its disturbing findings, as reported by the Washington Examiner, included the astonishing claim by 44% of respondents that Barack Obama had a “bigger impact” on the United States than President George Washington, the man who led the successful revolution against Great Britain, presided over the writing of the Constitution, served as the country’s first president, and took the historically unprecedented action of stepping down from leading his country to ensure a peaceful transition of power. More disturbing findings: “Younger Americans (under 38 – Gen Z and Millennials) are becoming unmoored from the institutions, knowledge, and spirit traditionally associated with American patriotism,” the survey analysis said. That half of millennials and Gen Z believe that the country in which they live is both “racist” and “sexist” shows that we have a major fraction of an entire generation that has been indoctrinated by teachers starting in grade school that America is what’s wrong with the world. Republicans are consistently the most extremely proud of their country, peaking at 80 percent in 2003 but still at 68 percent — higher than Democrats ever were. Liberals are at 36 percent in 2016, the lowest figure, save for those under-30 types. Only 34 percent of millennials are extremely proud to be American.